Belda is a medium-sized Ayleid ruin between the Imperial City and Cheydinhal containing conjurers. It contains two zones: Belda and Belda Lor. There is an Ayleid Well on the path up to Belda. Belda also appears in ESO. This location's map marker (M on map) is named Belda (editor name BeldaMapMarker). The entrance door is ENE of the marker, 90 feet away. 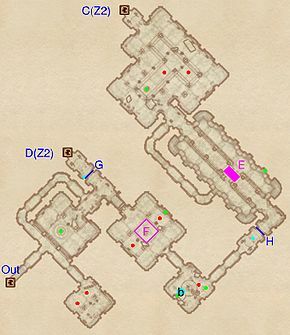 Belda is a fairly generic conjurer ruin. 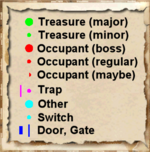 There are three doors, one of which leads to the outside (Out) and two lead to the next zone (C and D). However, the door at D is blocked by an iron gate which is opened remotely from the other side, so it is not accessible yet. It will serve as a shortcut exit once you get through the second zone. 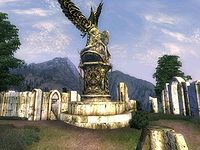 Watch out for the ceiling spike trap at F and the crumbling bridge at E. It might be worth falling down with the bridge for there is an Ayleid Reliquary on the bottom level. The passage to the left of the bridge leads up to the last room. 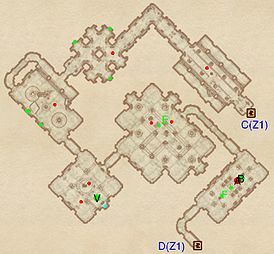 The last room contains several Welkynd Stones and leveled daedra. This is a straightforward zone and contains a huge amount of treasure and Welkynd Stones; just walk forward killing daedra/conjurers and picking up loot. There is a Varla Stone Cage (at V), and it is opened by an activation block right behind it on the floor (cyan dot on map). The boss of this ruin, a conjurer adept, is in the last room (A), as well as a boss chest at B, a set of novice alchemy equipment, 2 empty soul gems (1 petty and 1 lesser), and a locked reliquary and another chest. You can quickly exit to through door D; it leads back to Belda, near the exit in front of the iron gate that was inaccessible from the other side earlier. 1 Varla Stone (in a Varla Stone Cage) at V. The cage is opened by activating the Push Block on the floor behind the cage (cyan dot on map).